Background: There is a need for non-invasive and accurate techniques for assessment of severity of atherosclerotic disease in the carotid arteries. 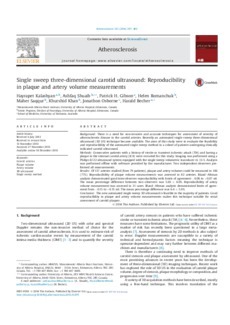 Recently an automated single sweep three-dimensional ultrasound (3D US) technique became available. The aims of this study were to evaluate the feasibility and reproducibility of the automated single sweep method in a cohort of patients undergoing clinically indicated carotid ultrasound. Methods: Consecutive patients with a history of stroke or transient ischemic attack (TIA) and having a plaque in the internal carotid artery (ICA) were recruited for this study. Imaging was performed using a Philips iU 22 ultrasound system equipped with the single sweep volumetric transducer vL 13-5. Analysis was performed offline with software provided by the manufacturer. Two independent observers performed all measurements. Results: Of 137 arteries studied (from 79 patients), plaque and artery volumes could be measured in 106 (77%). Reproducibility of plaque volume measurements was assessed in 82 arteries. Bland-Altman analysis demonstrated good inter-observer reproducibility with limits of agreement -0.06 to +0.07 ml. The mean percentage difference between two observers was 5.6% ± 6.0%. Reproducibility of artery volume measurement was assessed in 31 cases. Bland-Altman analysis demonstrated limits of agreement from -0.15 to +0.15 ml. The mean percentage difference was 6.4 ± 5.9%. Conclusion: The new automated single sweep 3D ultrasound is feasible in the majority of patients. Good reproducibility in plaque and artery volume measurements makes this technique suitable for serial assessment of carotid plaques.